Journal voucher entry mode is a special voucher mode in Tally where we can pass almost all types of accounting transactions. However, there are separate voucher mode for each type of transactions are available in Tally such as- Contra mode for Cash and Bank transaction, Payment mode for all Cash and Cheque payments, Receipt mode for all Cash and Cheque receipts, Purchase mode, Sales mode, Purchase Return mode, Sales Return mode and so on. All these transactions can also be pass through one single voucher mode that is Journal Voucher mode. If you do not want to change voucher mode for each type of transaction then just stay on Journal voucher mode and pass each transaction right from Journal mode. 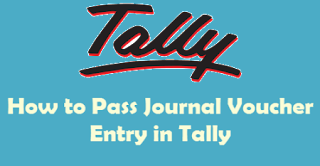 In this article, you’ll get a clear idea on what is Journal Voucher mode in Tally and how to pass journal voucher entry in tally. Go through the article. Suppose, you have a Debtor (ABC Co) having due balance of Rs.15000 and you received a Cheque of Rs.9500 from the Debtor against their dues and later you provided Discount of Rs.500 to the Debtor. So, here you can pass the receipt of Cheque entry in Receipt mode and for the Discount you can use the Journal mode where Discount Allowed ledger will be debit by Rs.500 and ABC Co will be credit by Rs.500. Now, check out another example, follow the step by step guide to pass a Depreciation entry through Tally Journal Voucher mode. So, start tally and open an existing company where already have an opening balance sheet. Open and check Balance Sheet report, check amount of a fixed asset ledger. 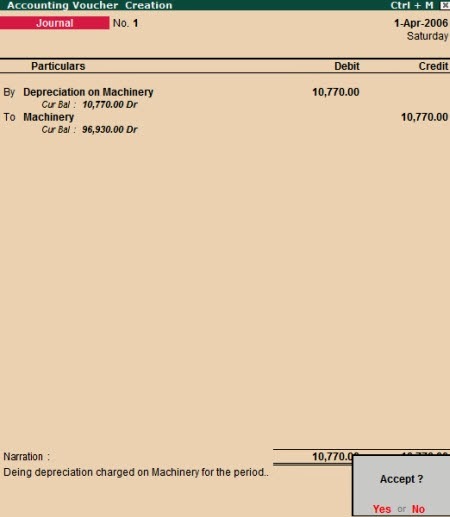 Here you can see, the balance of Machinery is Rs.107700. See the image below. 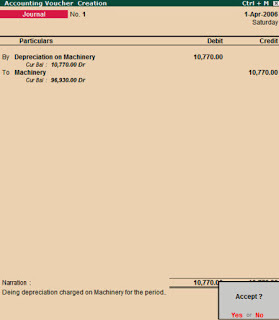 Now, we will charge depreciation @10% for full year on Machinery, go to Accounting Voucher from Gateway of Tally and Press F7 for Journal mode. First select “Depreciation of Machinery” ledger or press Alt+C to create the ledger. In the amount field press Alt+C to activate the AutoValue Calculator and calculate 107700*10% and press Enter, the calculated amount will be automatically posted to the amount field. Now select the Machinery ledger, put narration and save the entry. See the image below. Now, go to Balance sheet report and check the Machinery amount, the depreciation amount will be deducted from the Machinery and check the Profit and Loss report to see the Depreciation of Machinery ledger. Thats it. We have also arranged a video tutorial based on the above tutorial, check out the below video guide. The same way you can pass any transaction by debiting and crediting two ledgers or multiple ledgers. Hope you find the tutorial and video guide helpful for you and understand now what is Journal Voucher entry in Tally and how to pass Journal voucher entry in tally. If you have any queries related to the tutorial, feel free to contact with us using the comment form below and let us know how the process go on for you. Keep visit for more tally tutorials. thanks for sharing this valuable information. really a great post to be read. Many Thanks for Your Blog Post. Good Resource for All. 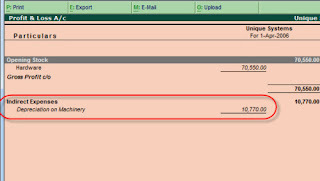 Sir, what is the meaning of passing JVs instead of maintaining a purchase register by a company? Both can be done depending on situation. If you allowing or receiving discounts while receipts money from debtors or paying money to creditors then you can pass the discount entry direct at the receipts and payments entry but if you allowing discount few days after receiving money then you can pass only the discount entry through journal voucher. This is very helpful site for tally user. Recording of all transactions in one general journal is a time consuming, laborious and troublesome task. Under double entry system there are mainly 7 different types of journal in accounting. How to activate single entry mode in journal voucher..
You can toggle between single entry and double entry mode in tally for Payment, Receipt and Contra voucher entry but not for Journal voucher entry. However you can toggle To/By instead of Dr/Cr in Journal voucher.